Embattled Speedskating Coaches Resign : The Two-Way They have been accused of physically abusing skaters and failing to report that one athlete sabotaged a Canadian competitor's skates. Speedskaters practice for the U.S. Single Distance Short Track Speedskating Championships, in Kearns, Utah, last month. Coach Jae Su Chun and assistant Jun Hyung Yao have resigned following allegations of abuse. U.S. Speedskating announced the departures of head short track coach Jae Su Chun and assistant Jun Hyung Yao in a news release this evening that also notes both are suspended through February, 2014. That means they cannot return to coaching in the United States before the next winter Olympics that same month in Sochi, Russia. The statement also says that disciplinary proceedings have begun against Olympic medalist and world and national champion Simon Cho, who admitted in an NPR interview last week that he had tampered with the skate blade of Canadian Olivier Jean at an international competition last year. Cho said he was ordered by coach Chun to tamper with Jean's skate but Chun has denied any role in the incident. An investigation conducted on behalf of U.S. Speedskating concluded last week that there is insufficient evidence "to conclude that coach Chun directed Simon Cho to tamper with the skate." But as NPR first reported Monday, the investigators failed to interview Canadian athletes and staff who were present at the event where the tampering took place. Several have reported angry and hostile behavior by Chun both before and after the tampering incident. The investigators' report also concluded that there were no persistent patterns of physical and emotional abuse. But an email purportedly from a skater who had been physically accosted by Chun — but praising the coach as "one of the best coaches in the World!" — turned out not to be from that skater at all. The report noted that "an adversarial proceeding under oath could generate a different conclusion" about Chun's involvement in the tampering incident. But the news release says that a schedule Nov. 1 arbitration hearing, which would include testimony under oath and cross-examination of witnesses, is expected to be canceled. Chun was suspended after abuse complaints were filed by more than a dozen short track skaters, including Olympic medalists. Most had left the national speedskating training program and said they would not compete in the World Cup season that begins next week if Chun and Yao remained on the job. Yao was suspended last week after investigators reported that both coaches admitted they were aware of the tampering incident shortly after it happened but did not report it. U.S. Speedskating says all athletes who qualified for World Cup competition, including those who filed abuse complaints, have agreed to rejoin the team now that the coaches have resigned. If the Nov. 1 arbitration hearing is not held, it appears the full facts of the abuse allegations and the tampering incident may never be known. Cho faces discipline ranging from a warning to suspension to a lifetime ban from the sport. He told NPR he is willing to accept punishment. But he continues to insist that Chun pressured him to sabotage Jean's skate, using his authority as a coach and as a Korean elder to break down his resistance. U.S. Speedskating appointed former Canadian short track coach Stephan Gough and former U.S. short track coach Pat Wentland as interim coaches. U.S. Speedskating's announcement that "disciplinary proceedings against Simon Cho have begun and are continuing" is a surprise to Cho's attorney. John Wunderli says he's not aware of any proceedings involving his client. "I don't know anything more that what's in the statement issued by USS," Wunderli tells NPR. USS spokeswoman Tamara Castellano says that all that is underway so far is the process of forming a disciplinary panel that will hold a hearing. The panel must include at least one athlete, Castellano says, and will not include anyone named in the multiple grievances filed against former coaches Chun and Yao. Under federal law, Cho can challenge the panel's sanctions by filing a complaint with the U.S. Olympic Committee (USOC) in which he would claim the sanctions unfairly keep him from competing. Cho can also demand binding arbitration and U.S. Speedskating, under USOC rules, would have to submit to arbitration. That may be Cho's only hope for a full hearing with witnesses testifying under oath and subject to cross-examination. A source close to Chun says the former coach will issue a statement tomorrow apologizing for his failure to disclose his awareness of the tampering incident involving Cho. But he continues to deny ordering Cho to sabotage the Canadian athlete's skate. Ed Williams, the attorney for the athletes who filed a Demand for Arbitration against U.S. Speedskating and former coaches Chun and Yao, says "the boycotting athletes are pleased that the two coaches, faced with the prospect of being cross-examined under oath at the scheduled Nov. 1 arbitration hearing, have seen fit to resign." Williams says the resignations "largely render moot the arbitration proceeding" but he vows to press ahead with a grievance filed with U.S. Speedskating over alleged mismanagement of the group. "We're going to continue with that," Williams says on behalf of the complaining athletes. U.S. Speedskating "needs to be reformed." Olympic short-track medalist Allison Baver is among the athletes who filed complaints against Chun and Yao. Baver also sits on the USOC's Athletes Advisory Council and is concerned that the USOC has not been responsive enough soon enough to the speedskaters' complaints. "We will continue to pursue justice," Baver says. 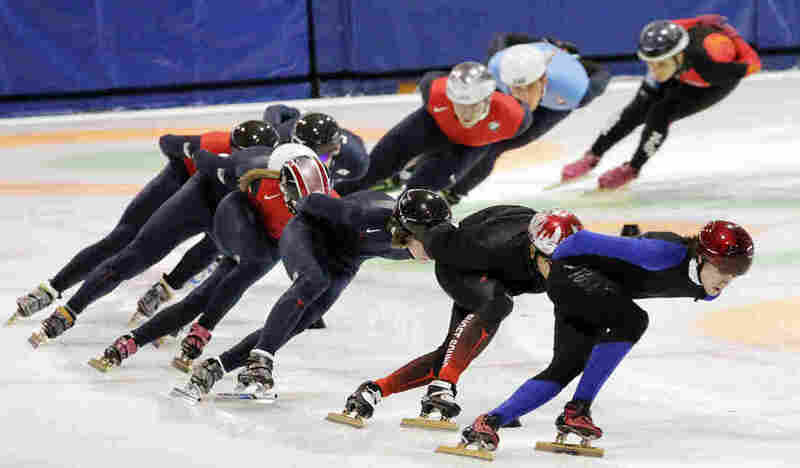 "We are among the best athletes in the world and the U.S. Olympic Committee and U.S. Speedskating have failed" to protect the short-track skaters who filed complaints. Baver also hopes the U.S. Speedskating disciplinary panel "considers Simon [Cho] a victim of abuse and not the aggressor," in the tampering incident. "He was bullied" by his coach, she alleges. U.S. Speedskating spokeswoman Tamara Castellano says the Nov. 1 arbitration hearing has been formally canceled.